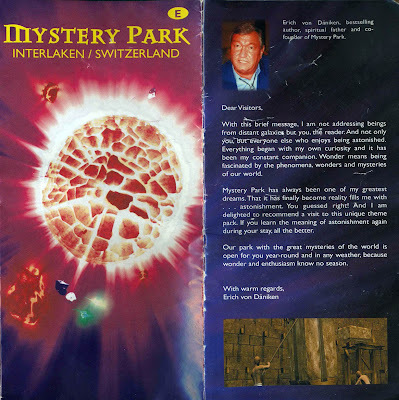 What appears below is part of an old brochure for Mystery Park, an "amusement park" in Interlaken, Switzerland that is dedicated to crackpot theories. Kristen and I passed through a few years back, took one look at the brochure and quickly decided not to go but to instead laugh at Mystery Park and its adherents. I kept the brochure because the address of the founder — a cardio emergency of a man named Erich von Däniken — was especially hilarious. Seriously, this was apparently the best photo they could find, even with the bolo tie askew. It's not exactly a face that elicits my trust. Here is the letter to potential visitors that so tickled me. My favorite phrase — which I would guess arose from a rough translation — became the title of this post. And then there's an image of what I assume is people building the pyramids, only it looks like it was created on a Nintendo 64. Finally, a quick Wikipedia check on the park indicates that it is the subject of some controversy. Dubbed "a cultural Chernobyl" by a member of the Swiss Academy of Sciences, the park drew ire from science-types for von Däniken's allegations that aliens are responsible for various human triumphs, like the Nazca Lines. Also, it's currently closed, due to financial problems. I'd guess too many people saw the brochure. Click on the image above for to open a full scan of the brochure. I actually read his book, Chariots of the Gods, when I was a young, nerdy X Files fan. He brings up some interesting points, but there's also a whole lot of crap. Yeah, you're too young to remember the film of Chariots of the Gods that I remember seeing when I was way younger (it came out in 1972). 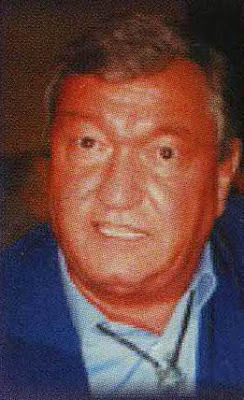 But it seemed like von Daniken was correct to all of us 9-year-olds. And now I have to wonder if he bought his "von" at the same store Nipper got his.